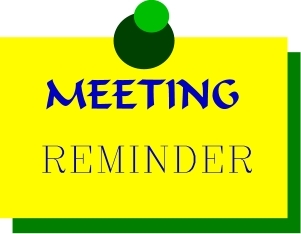 Posted November 14, 2018 There will be a meeting of the Water Island Civic Association Executive Committee this Saturday, November 17, 2018, at 9:00AM at the Firehouse. All are welcomed and encouraged to attend and become involved. 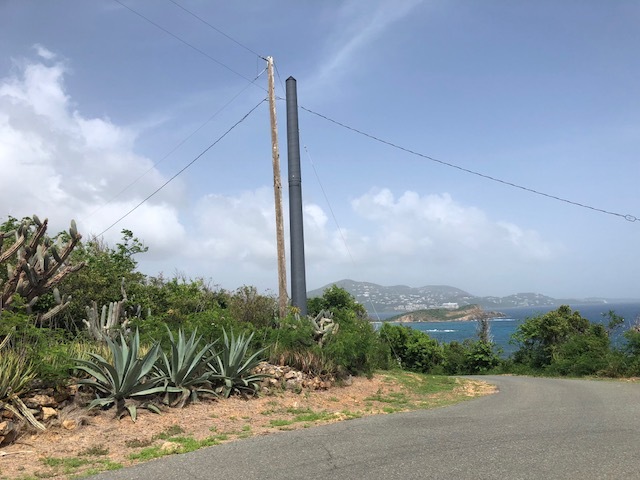 Posted September 19, 2018 It looks like WAPA is moving along with installing the new fiberglass electric poles on Water Island. Hopefully they are stronger and more durable than the wooden poles. We have no schedule of a completion date. 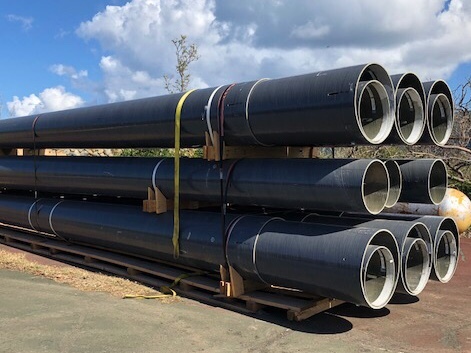 Posted August 10, 2018 The contractor is back on island to replace our wooden poles with composite poles. We are not sure of the work schedule. The poles are being stored at the tennis court. Posted August 8, 2018 It is with great sorrow that we note the passing of a real friend. Joanne Bohrâ€™s father, Andrew E.(Barney) Poline passed away this morning at 94 years of age. He passed away peacefully at his home, surrounded by family, in Fairfield, New Jersey. Services will be held at Stellato Funeral Home on Sunday August 12th from 3 to 7 PM. A funeral mass will be held at St.Thomas More at 10AM Monday August 13th in Fairfield New Jersey. Born in Brockton, MA. to the late Andrew E. & Teresa Sliney Poline.He lived in Clifton, NJ. For his early years until moving to Fairfield in 1959. Barney served in the 4th Division, US Marine Corps and remained active in the Marine League and Iwo Jima reunions throughout his life. He was a life member of VFW Post #7295 Fairfield and American Legion Post #249 Parsippany, NJ. He retired as a field inspector for a Robins Engineering of Totowa, NJ. in 1989 allowing him to travel the world with the love of his life, his wife Marita Teehan Poline who predeceased him in 2017. Barney loved life and had many interests. Travel took many forms, including many cruises and extended visits to Water Island. Barney & Marita were among the founding families of St. Thomas More Parish where he served the church working Bingo, Knights of Columbus and Holy Name Society and as an usher for almost 40 years. Of all his interests, his main focus was always â€œFamily Firstâ€?. He was the loving father of Marita M. Poline, Joanne Bohr & husband Bob, Margaret Kaplan, Dorothy Washer, Andrea Henry & husband Richard. He was the devoted grandfather of Michele, Robert, Jennifer, Michael, Daniel & Thomas and special great grandfather of Samantha, Jason, Henry, Mackenzie, Ella & April. Barney was predeceased by his brother Alexander. Mr Albert Bryan, candidate for Governor, and Mr Stedmann Hodge, Senate Candidate, have been to Water Island recently and want to meet and hear our issues and ask questions. 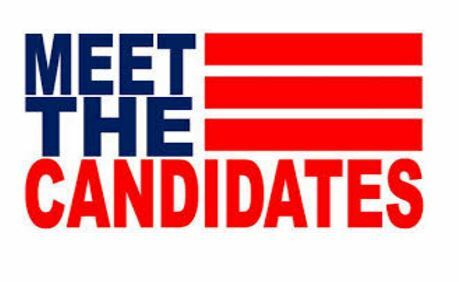 The primary is August 4th. Erik and I have offered to assist setting up a meeting. WhereÃƒÂ¢Ã¢â€šÂ¬Ã¢â‚¬Â?Honeymoon Beach ÃƒÂ¢Ã¢â€šÂ¬Ã¢â‚¬Å“Heidi has offered use of her area. Why-- Because we need to get focus on Water Island needs and concerns and take advantage of people who want to hear from us. Even if you do not vote here, I hope you will attend if at all possible. PSÃƒÂ¢Ã¢â€šÂ¬Ã¢â‚¬Â?this is NOT a WICA eventÃƒÂ¢Ã¢â€šÂ¬Ã¢â‚¬Â?just to be clear, WICA cannot offer support to any political candidate or party under our bylaws. Posted July 9, 2018 The Office of the Tax Assessor is issuing 2018 Property Tax Bills to all property owners on record as of Jan. 1, 2018, according to a press release from the Office of the Lieutenant Governor. The 2018 bills will become due on July 28, 2018. Property owners whose structural damage information has been reviewed will see reassessments on their 2018 bills. The Office of the Tax Assessor will continue its efforts to review all structural damage information submitted for the first time by Friday, July 28, 2018. The minimum tax of $360 is implemented by V.I. law, when credits reduce tax amount below the $360 amount. Property tax bills may be paid online at the Office of the Lieutenant GovernorÃƒÂ¢Ã¢â€šÂ¬Ã¢â€?Â¢s website at https://propertytax.vi.gov; however, payment plans must still be made through the Office of the Tax Collector. The 2018 bill will also include information on unpaid tax years. Property owners who have not paid their prior tax year bills are encouraged to contact the Office of the Tax Collector to make arrangements for payment. 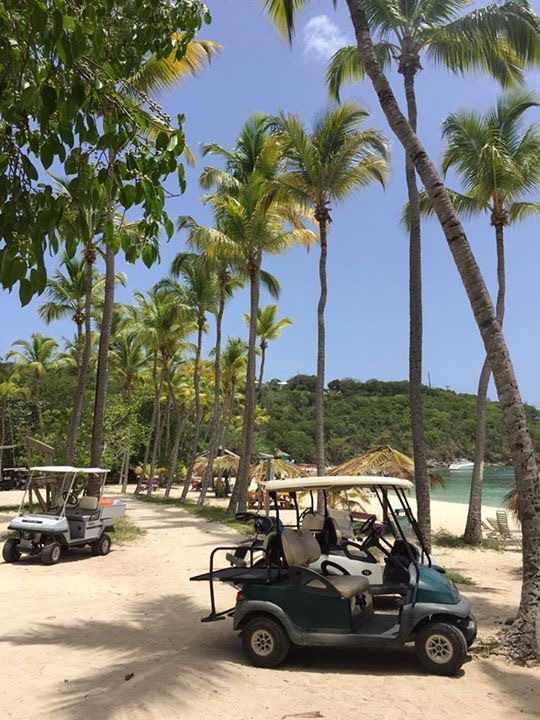 Posted July 1, 2018 As you may have seen, the dump is all cleaned up from the debris left on the ground after hurricanes Irma & Maria. (See the photos above.) FEMA contractors and VI Waste Management did a great job of slowly chipping away at the pile. As of late, WICA hired Flacco to manually load lumber into the bins to maximize space in the bins. Murf donated his time and tractor to load the bigger items into the bins. Thank you Murf! So now the place looks good. BUT, WE ALL NEED TO DO BETTER as time goes along to keep the dump in shape. Please (1) no dumping on the ground. (2) if the item is too big for you to lift into the bin, get someone to help you-do not drop it off and expect someone else to put it in the bin. (4) place tires in the ÃƒÂ¢Ã¢â€šÂ¬Ã…â€œtire pileÃƒÂ¢Ã¢â€šÂ¬Ã‚Â? oil in a sealed container and place on the ground close to the oil containers. (6) business owners please advise your staff to help at the dump each time they drop off debris. PLEASE be good neighbor and pick up around the bins when you drop off stuff. Spend 5 minutes picking up each time you go to the dump. If we all do a little bit, we can keep the dump safe and somewhat clean. Posted June 29, 2018 Reeived from Joanne Bohr - "I went to DPNR again, it is behind Plaza Extra at the library. A few weeks ago, a friend drove me there to renew the registration on the boat, but computers were down. The agents advised the boat registration extension is now until 31 July and when I asked about mailing, she gave me the form attached. You need to send a copy of your current registration and a check with it. JP provided mailing address below. Fees for our 17ÃƒÂ¢Ã¢â€šÂ¬Ã¢â€?Â¢ boat are unchanged but I think mooring fees are increasedÃƒÂ¢Ã¢â€šÂ¬Ã¢â‚¬Â?not sure. I am sending this out in case anyone else needs it. 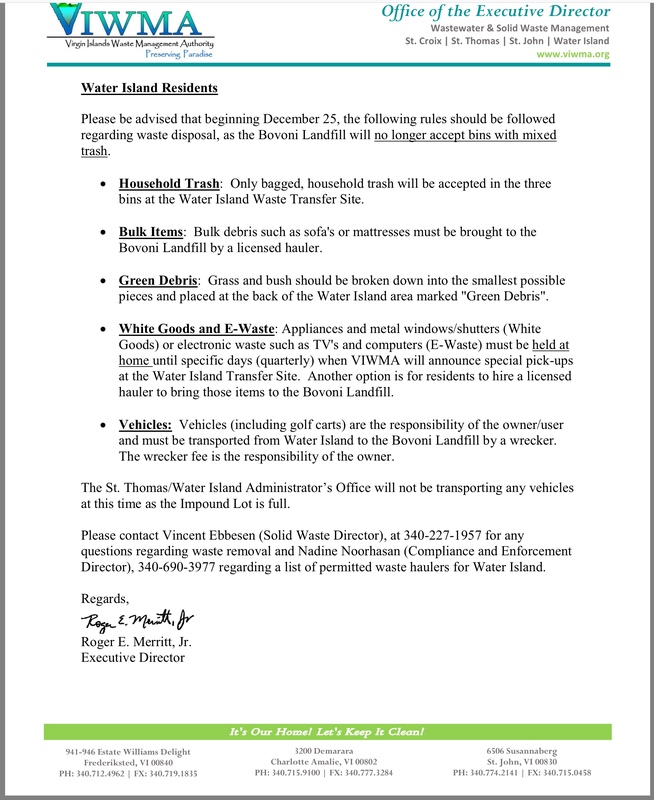 Poster June 4, 2018 WICA has been informed that the VI Waste Management Authority is coming over to pick up metal refuse. Chuck Gidley and Flacco helped Murf with his tractor move all the metal to one location. They also loaded other debris into one dumpster. WICA will have Flacco continue to load wood refuse into one dumpster per week. Thank you WICA! Thank you Murf! Thank you Chuck! Thank you Flacco! Posted May 19, 2018 Have you been to the dump recently? Have you noticed a huge improvement? 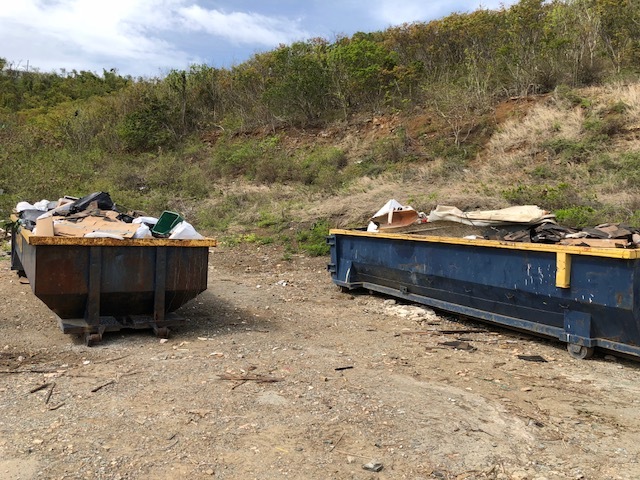 Thanks to WICA, with the help of Chuck Gidley coordinating, we have been able to improve the Waste Transfer Site (The Dump). For the past several weeks on Thursdays and Friday mornings Chuck has had Flacco cutting up all the large pieces of wood that had been left on the ground and putting them in the dumpsters. We will continue to do this until all of the wood is removed. We will then come up with a plan to dispose of the metal. 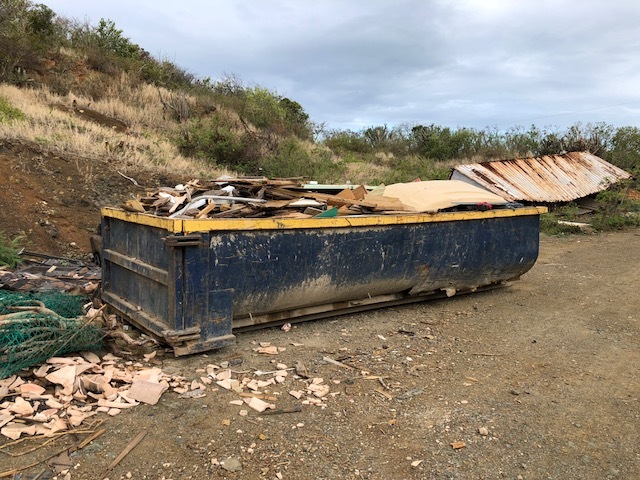 Just a reminder to all of our residents and any contractors working for our residents/property owners - PLEASE DO NOT DUMP ANYTHIING ON THE GROUND. 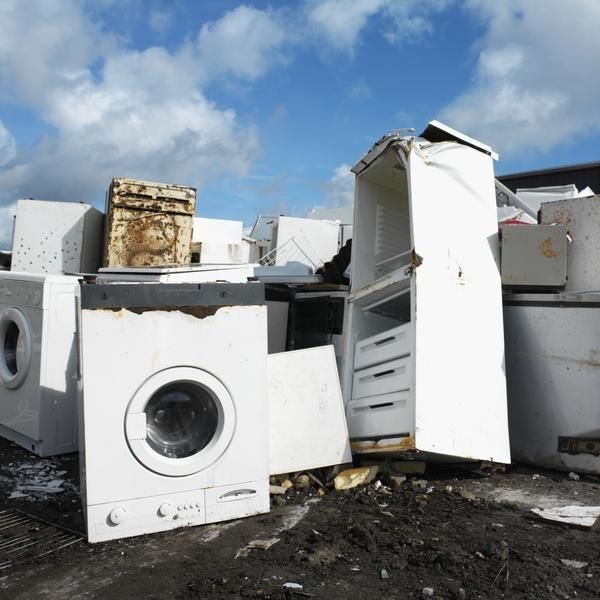 WHITE GOODS AND METAL SHOULD BE STACKED IN THE BACK OF THE DUMP AREA TO BE ADDRESSED LATER. Governor Mapp announced that $430 million has been added as of today towards the construction of a modern road system and to bring all roads up to U.S. DOT standards, in the U.S. Virgin Islands. This is in addition to $100 million in Garvee bonds that is in process. All of Water Island's 11 miles of roads are included in this plan for a cost of $8 million dollars. 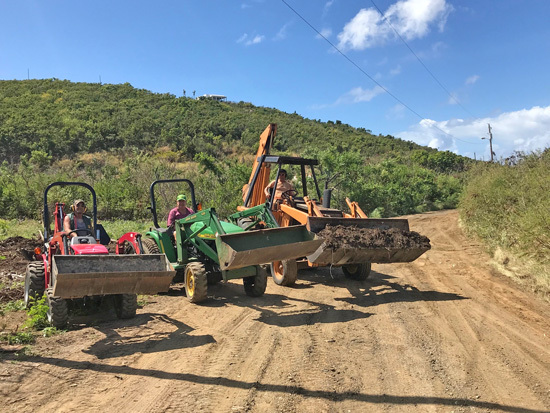 This follows the full assessment of the Virgin Islands 1,273 miles of roads which was conducted post hurricane in an effort to plan and conduct comprehensive repairs across the territoryÃƒÂ¢Ã¢â€šÂ¬Ã¢â€?Â¢s four islands. It will cost a total of $1.2+ billion dollars to bring them up to Department of Transportation standards. To read the full artcile on the St. Thomas Source, Click Here. From The WICA President - News From FEMA! Posted March 10, 2018 Water Island received some good news this week regarding continuing hurricane recovery efforts. The Civic Association will continue to monitor progress of these projects. FEMA Public Assistance Funding projects for Water Island, which were submitted under the Department of Public Works, have been awarded totaling $523,000.00. Posted March 6, 2018 After some VERY wicked and wild high seas, Honeymoon Beach looked like a large rock pile. Not for lomg though! Intrepid Water Islanders converged on the beach and the dock to clean it right up and make it presentable. Heidi made sure coffee was available for all the volunteers! Good job to all that cleaned up! Thank you Julie Northup for the pictures! 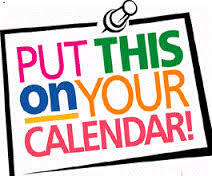 Posted February 27, 2018 The next WICA EC Meeting will be held on Saturday, March 10, 2018 at 9:00AM at the Firehouse. Please come out and get involved. All are welcome. On Friday, February 23, 2018, Water Island was fortunate to have been paid a visit from Department of Public Works Commissioner Nelson Petty, thanks, primarily, to the efforts of Erik Ackerson. The Commissioner was accompanied by Special Assistant Kinila Callendar and Supervisor Sean Brown. Mr. Ackerson was unable attend due to other commitments, so WICA President David Roselle stood in for him. The group was joined by Colette Monroe, Policy Advisor to the Governor. 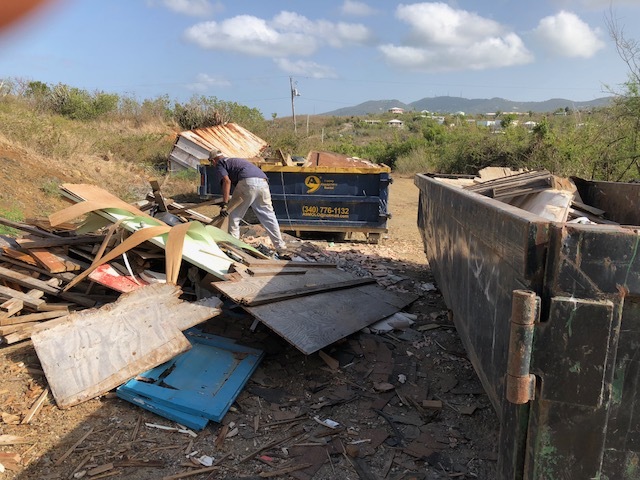 The primary purpose of the visit was to survey the status of roadside debris removal in response to complaints that some areas had been overlooked and the job of removal was not yet complete. 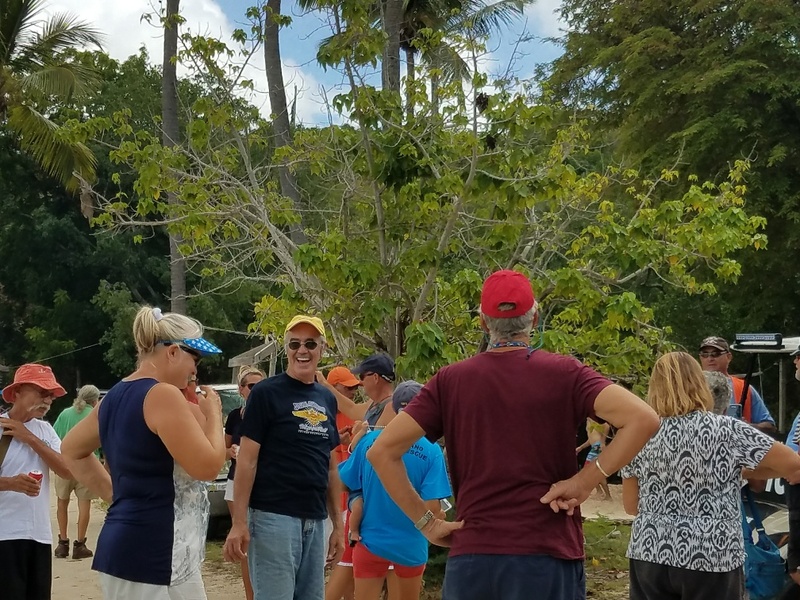 The group made a partial tour of Water Island, stopping to observe remaining debris, and discussion followed regarding solutions. Some of the areas visited were the Firehouse yard, Fort Hill Road, Main Road and Honeymoon Beach. 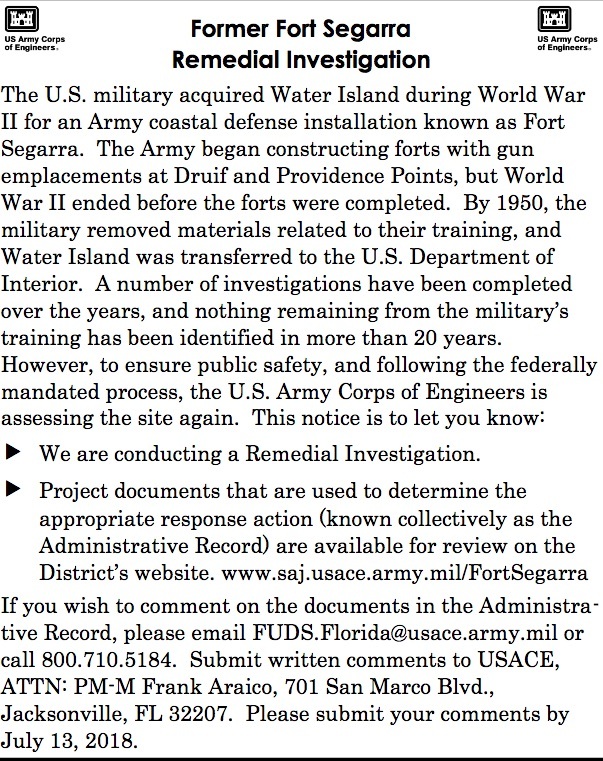 During the course of the visit, we were informed by Ms Monroe that, subsequent to tours of the island that she made after the two hurricanes with representatives of FEMA, twenty seven projects have been noted and tentatively approved for improvement, including road repairs, removal of downed trees at Honeymoon Beach, repairs to Upper Flamingo (firehouse) Road, and repair of the Dinghy Dock. WICA has little information on the projects, as WICA was not informed of, nor invited to participate in, these surveys, nor the scope of any mitigation or repairs decided upon. 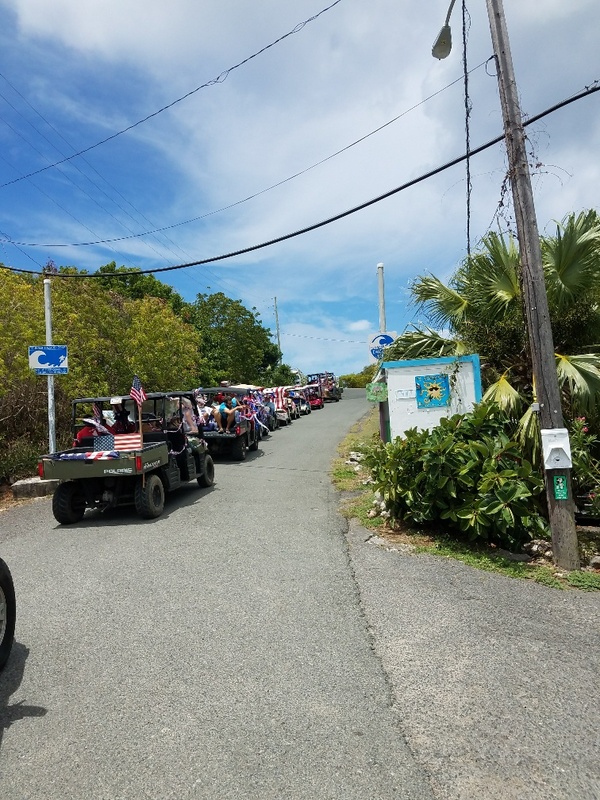 The Commissioner explained that financing for these projects, as well as funds for the work that has already been done on island, are still in the hands of the Federal Government, thus stymieing the efforts of DPW. It is frustrating to all concerned. The revelation of these plans is encouraging, nonetheless, and Mr. Roselle, on behalf of WICA, asked for a comprehensive list of the projects so that all Water Islanders may become better informed of plans for the island, and we expect the list to come soon via Ms Monroe. When the approved projects list is received from Ms Monroe WICA will make sure it is available to all Water Islanders. Roadside grass cutting was among other subjects discussed during the visit. Acknowledging DPWÃƒÂ¢Ã¢â€šÂ¬Ã¢â€?Â¢s limited funds, WICA has assumed much of that responsibility. Mr. Roselle requested at least one cutting by the VI Government in 2018, and asked that he be consulted about scheduling in order to maximize the benefit. Additionally, he requested more reclaimed asphalt for the dump road to replace what Irma washed away. 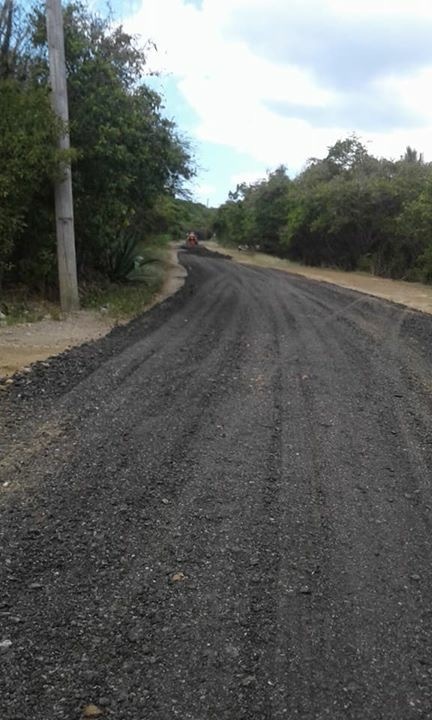 Commissioner Petty advised that presently, DPW has no more of the material, but said that more would become available as road repaving projects on St. Thomas are able to be resumed. 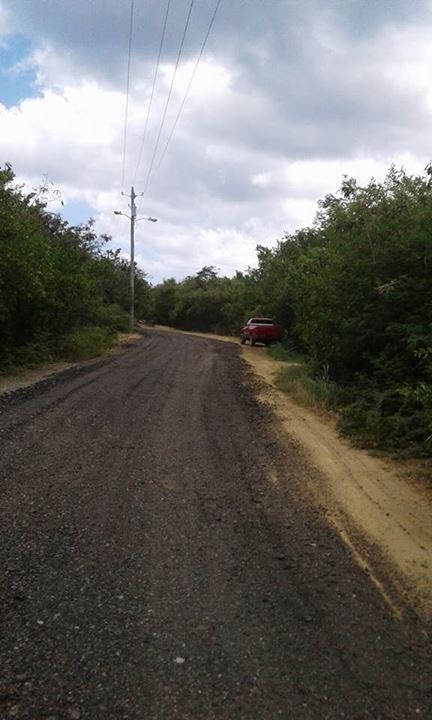 During the tour of the island, the condition of other roads was apparent as well. 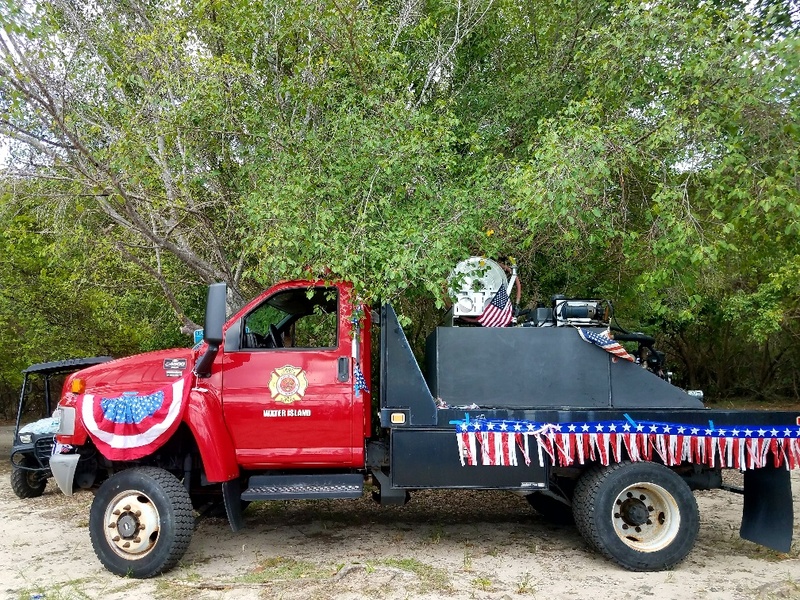 Mr. Roselle expressed the Civic AssociationÃƒÂ¢Ã¢â€šÂ¬Ã¢â€?Â¢s desire, as representative of the majority of Water Islanders, to be included in the planning of recovery efforts, and to have a ÃƒÂ¢Ã¢â€šÂ¬Ã…â€œseat at the tableÃƒÂ¢Ã¢â€šÂ¬Ã‚Â? on future matters relating to the island. 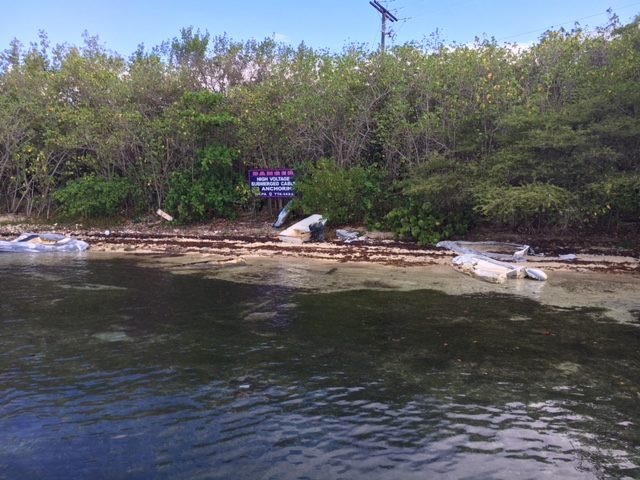 Commissioner Petty appeared to think the request reasonable and, at the end of the tour, stated that he will request the Corps of Engineers to bring equipment back to the island to complete debris cleanup. If past is prologue, and based on our discussions, Water Islanders have reason for cautious optimism. 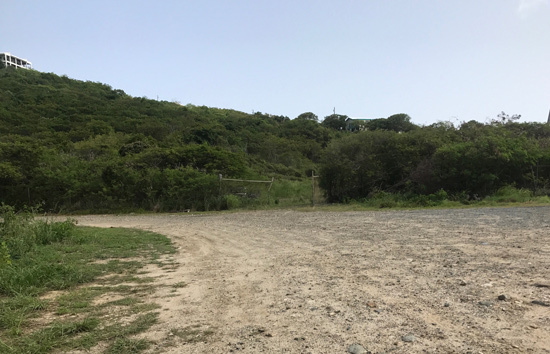 The Department of Public Works has been helpful on several past projects, including last yearÃƒÂ¢Ã¢â€šÂ¬Ã¢â€?Â¢s WICA project of paving the Deepwater Dock Road with reclaimed asphalt, for which DPW provided material and trucking at no cost to Water Islanders. As we all are aware, problems remain, and, inevitably, unexpected delays will occur. WICA will continue, with the help and support of other civic minded residents like Erik, to represent the interests of all Water Islanders. Posted on February 5, 2018 Thanks again, WISAR! Since one can never say ÃƒÂ¢Ã¢â€šÂ¬Ã…â€œThank YouÃƒÂ¢Ã¢â€šÂ¬Ã‚Â? 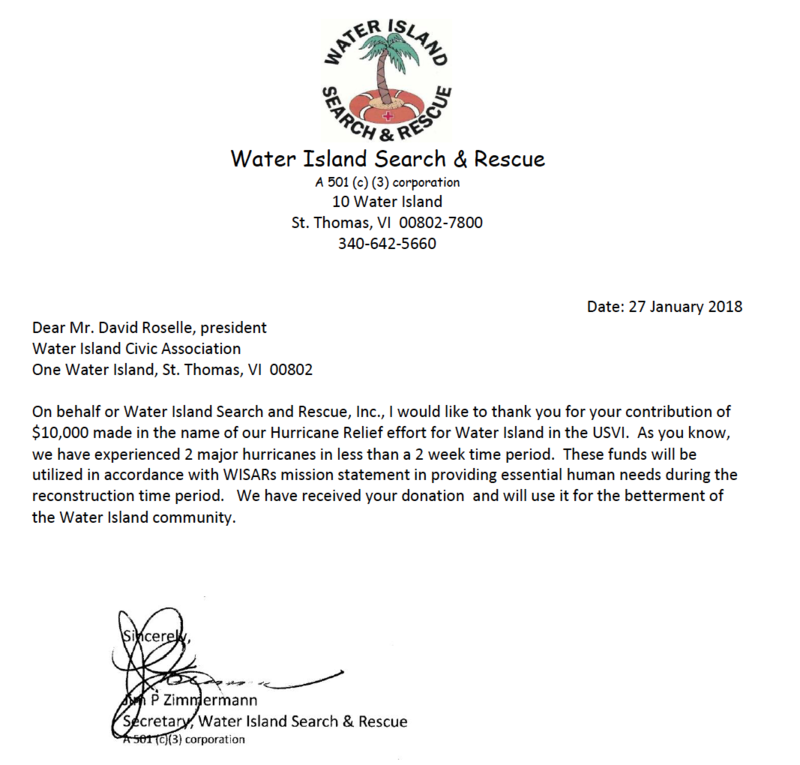 too many times, WICA, on behalf of all of its the members, would like to take this opportunity to again thank Water Island Search and Rescue for their leadership and efforts in the aftermath of the two Category 5 hurricanes that struck in September. From day one, September 7, 2017, Water Island couldn't have asked for a more dedicated group of people to support our residents, whether in the form of distribution of much appreciated supplies, support or information. It is important to recognize that IrMaria was a true ÃƒÂ¢Ã¢â€šÂ¬Ã…â€œtrial by fireÃƒÂ¢Ã¢â€šÂ¬Ã‚Â? for WISAR. Hurricane Irma was the first catastrophic hurricane to strike the Virgin Islands since the organization was founded, and then to be followed two weeks later by hurricane Maria is an almost unimaginable challenge for an untested outfit. WISARÃƒÂ¢Ã¢â€šÂ¬Ã¢â€?Â¢s performance has been exemplary, thanks to a lot of hard work by dedicated individuals. In addition to our gratitude, WICA takes a unique pride - a parental pride, maybe, in WISAR's growth and accomplishments. The Water Island Civic Association pledges our appreciation and continuing support for Water Island Search and Rescue. Prior to the formation of WISAR fifteen years ago, in 2003, by Marion Wilkinson and Larry Stein, WICA was responsible for actions after an emergency, via its Disaster Preparedness Committee. 1 Seeking accreditation through the Red Cross, Federal Emergency Management Agency (FEMA), Virgin Islands Emergency Management Agency (VITEMA), and other such agencies or entities, in order to become the qualified representatives of such agencies on Water Island. 2 Consulting with such agencies to determnine the quantities and scope of emergency supplies and equipment to be stages on Water Island on a sinc or temporary basis. 4 Coordinating any and all relief efforts with the volunteer cadre of Water Island, including the use of personal vehicles and boats. Since the formation of WISAR, WICA has not had a Disaster Preparedness Committee, as that would be a duplication of effort and expense. We now know for certain that Water IslandÃƒÂ¢Ã¢â€šÂ¬Ã¢â€?Â¢s disaster needs are in capable hands. Thank you, yet again, to all the dedicated WISAR volunteers! A Little Bit Smoother Ride! 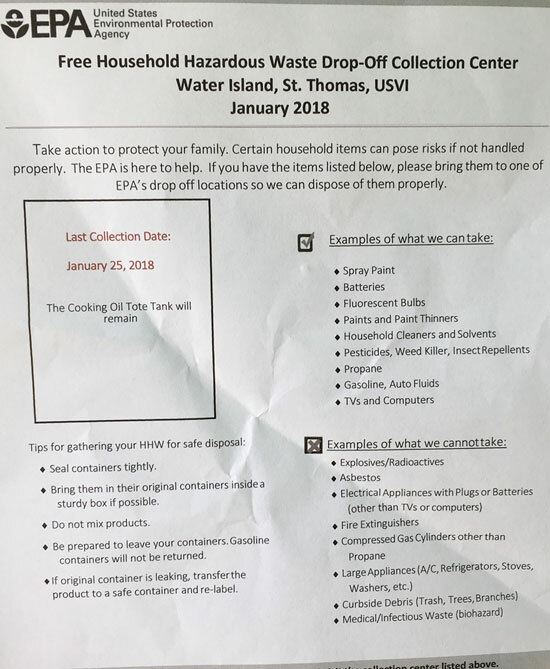 Posted February 5, 2018 WICA organized and paid several of our members to make your ride to the trash transfer station a little smoother. 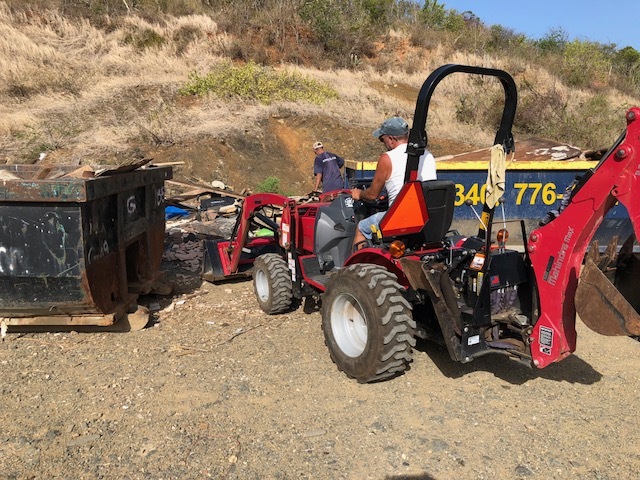 Members Stuart Butler, Cliff Moore and Patrick "Murf" Murphy, joined forces on behalf of WICA to create a smoother path to the transfer station. 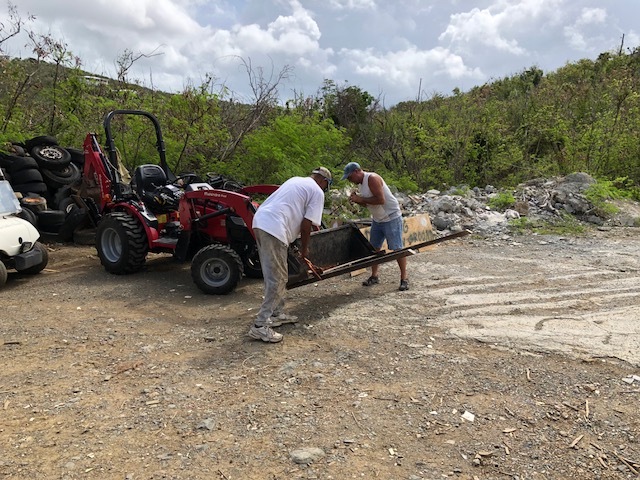 We're still hoping that DPW will be able to provide more reclaimed asphalt to replace what was washed away in IrMaria, but in the meantime, we hope this helps. If your neck doesn't hurt after a trip to the dump, you know who to thank. Posted February 1, 2018 It is with a heavy heart we report the passing of one of our beloved long-time residents of Water Island, Margot Hoepfner. 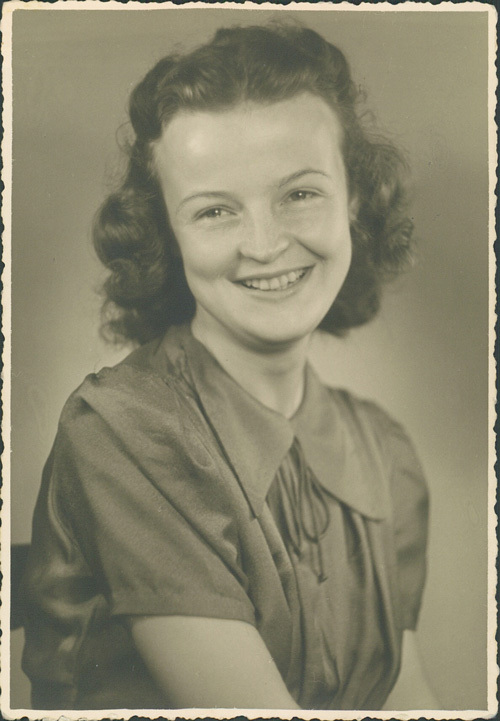 It is with much sadness and sorrow I share the passing of my mother Margot Edith Hoepfner last Friday Jan 26, 2018. I was holding one hand my brother John the other when she took her last breath at my brotherÃƒÂ¢Ã¢â€šÂ¬Ã¢â€?Â¢s home. 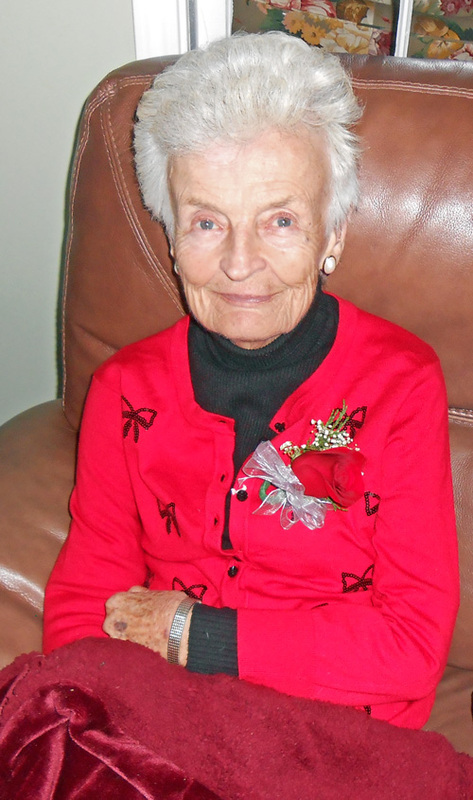 She was surrounded by family and loved ones and left this earth peacefully after a brief illness. The top picture of her was at Christmas just 30 days prior and the other a beautiful woman with hope and promise of a bright future! She was 88 soon to be 89 in May. She joins my father Gunter Hoepfner who passed away September 26, 2016. Her life continues in the future through her children Arnie, Ingrid (grandsons Eric and Dylan and spouse Mark) and John (grandsons Alex and Eric and spouse Terrie). She survived World War 2 in Germany and orphaned at 19 with a 13 year old sister to raise. She married Gunter and immigrated to USA in 1956 with 2 children speaking not a word of English. They successfully started a men's clothing store ÃƒÂ¢Ã¢â€šÂ¬Ã…â€œGunterÃƒÂ¢Ã¢â€šÂ¬Ã¢â€?Â¢s" in 1959 which operated for 41 years. She always supported the business and provided the loving home life we all needed. Margot and Gunter came to Water Island in the 1970ÃƒÂ¢Ã¢â€šÂ¬Ã¢â€?Â¢s and built 2 beautiful homes. We will carry on the legacy which they have passed down to us. Let us all remember our forefathers contributions to beautiful Water Island and make it a better place to live the rest of our LIVES! As everyone knows, Water Island, along with our sister islands, was devastated by two Category 5 hurricanes, Irma and Maria, in September. Many homes were damaged, some severely. 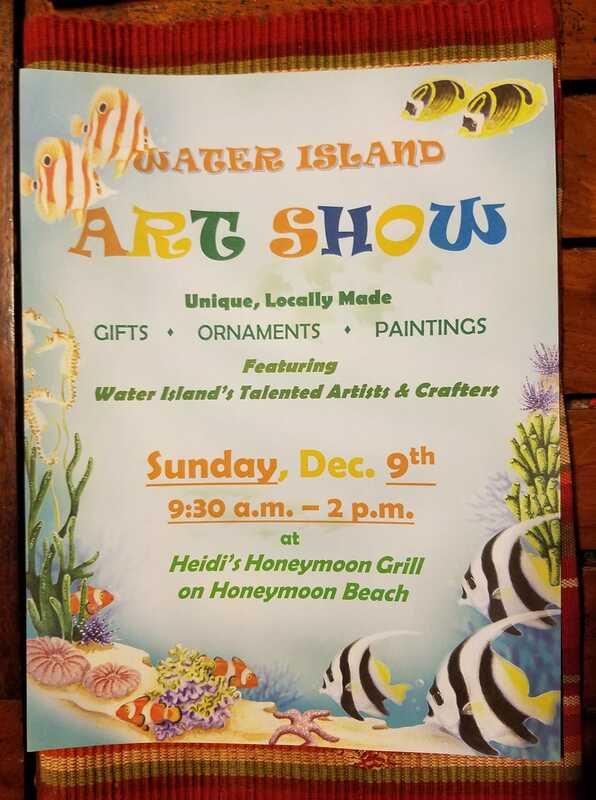 We lost Schaeffer Hall and the small pavilion on Honeymoon Beach, and HeidiÃƒÂ¢Ã¢â€šÂ¬Ã¢â€?Â¢s Honeymoon Grill was blown away. DinghyÃƒÂ¢Ã¢â€šÂ¬Ã¢â€?Â¢s Beach Bar and Grill sustained severe damage as well. The landscape went from green to brown in a day. Many roads became impassable, and Flamingo lagoon became a pileup of damaged craft. It was a bleak time on the island. Water Island is green again! Plants and trees have regained their leaves and our beautiful landscape has returned. In those first few weeks, Water Islanders toiled tirelessly to open up the roads and perform what cleanup tasks they were able. Thanks to Cliff Moore and Stuart Butler. With their equipment, and the help of others, most roads were opened for traffic within a very few days. Honeymoon Beach is now cleaned up and open, and tourists are arriving and enjoying the island again. HeidiÃƒÂ¢Ã¢â€šÂ¬Ã¢â€?Â¢s and DinghyÃƒÂ¢Ã¢â€šÂ¬Ã¢â€?Â¢s are both back in business. We congratulate them. Water Island Search and Rescue, under the direction of Rachael Ackley, took charge from the very first day, opening up the firehouse to displaced residents, distributing relief supplies and disseminating information as it became available. The firehouse became the go to place for residentsÃƒÂ¢Ã¢â€šÂ¬Ã¢â€?Â¢ needs. WICA donated $10,000 to help WISAR fund needed supplies. WISAR received and installed a 15 kw generator, which had already been provided by a grant from the Department of Homeland Security with the help of Todd Patton of VITEMA, to serve the firehouse, which enabled them to provide important services. Thanks go to Colette Monroe, who has worked tirelessly representing the VI Government in directing the recovery effort. 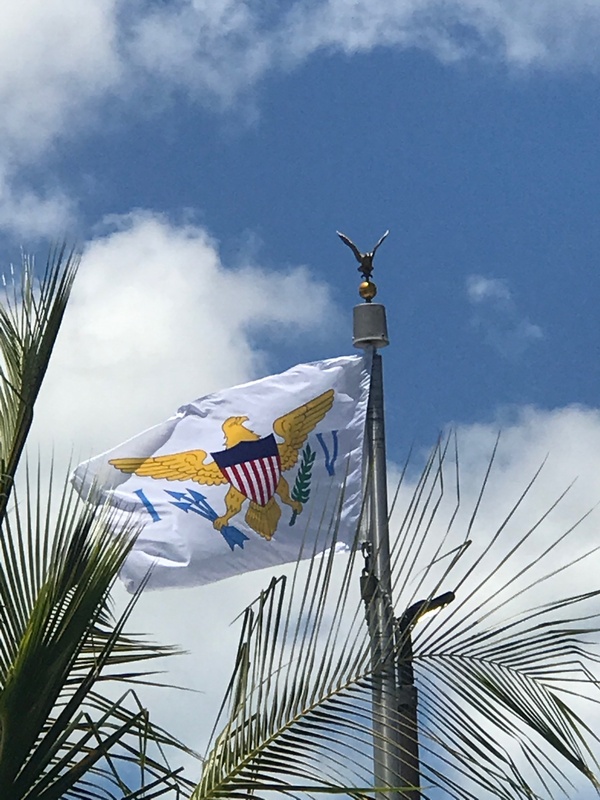 When Colette isnÃƒÂ¢Ã¢â€šÂ¬Ã¢â€?Â¢t busy keeping an eye on progress on the island and making sure that resources are being used efficiently, sheÃƒÂ¢Ã¢â€šÂ¬Ã¢â€?Â¢s meeting with FEMA representatives and other Federal and Territorial officials, reacting as conditions and priorities change. On October 14, as Water Islanders were lined up for the gas truck (provided by Tri Island Energy every other week), we were thrilled to witness the arrival of 28 linemen from the states, along with bucket trucks and other equipment. These electrical workers have worked diligently, setting poles and stringing wire. 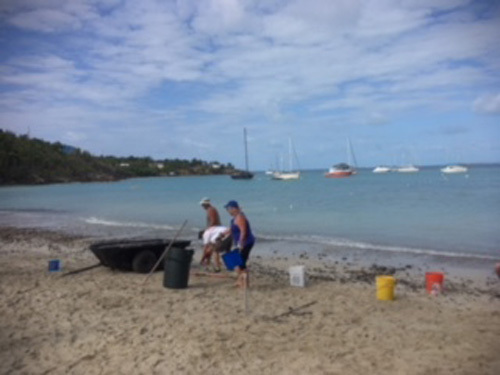 Additionally, they have become honorary Water Islanders, doing jobs that werenÃƒÂ¢Ã¢â€šÂ¬Ã¢â€?Â¢t theirs to help restore normality, including refloating the dinghy dock. We are grateful to them for their tireless efforts, and our electrical transmission lines are in better condition now than they have been in many years. They tell me that our appliances should last a lot longer now! There is good reason to believe that electrical service could begin to be restored on Water Island next week! ItÃƒÂ¢Ã¢â€šÂ¬Ã¢â€?Â¢s hard to single out individuals, when so many Water Islanders have contributed so much, not only to the work, but to keeping Water IslandersÃƒÂ¢Ã¢â€šÂ¬Ã¢â€?Â¢ spirits up. Sunday pot luck meals on the beach and breakfasts at the fire station, have promoted our feeling of community, and we thank those who are performing these labors of love. I would be remiss to not commend Millie Lovett, who has been a whirlwind of activity, organizing and leading cleanup days, among other efforts,, including a trip to the states to purchase supplies and secure donations. Millie set up a GoFundMe account, and has collected and spent over $20,000 providing relief goods and services to Water Island. Millie has become a valuable member of the community and an inspirational example of the power of a positive attitude. Be sure to thank her when you see her. 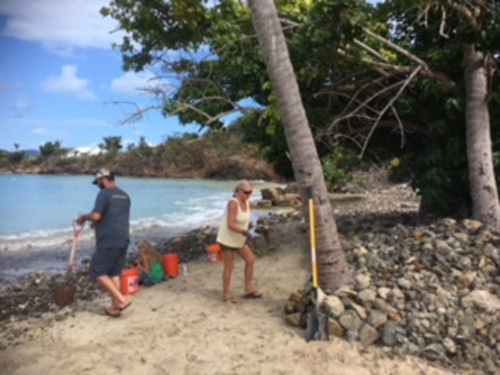 WeÃƒÂ¢Ã¢â€šÂ¬Ã¢â€?Â¢ve come a long way since September 6, and there is still much to do, but thanks to the resiliency and determination of our friends and neighbors, Water Island is well on the road to recovery. Posted November 16, 2017 Our dear friend, Robin Greenlee has passed away after a long battle. We will miss him terribly. Our thoughts and prayers go out to his loving wife, Margie and their family. 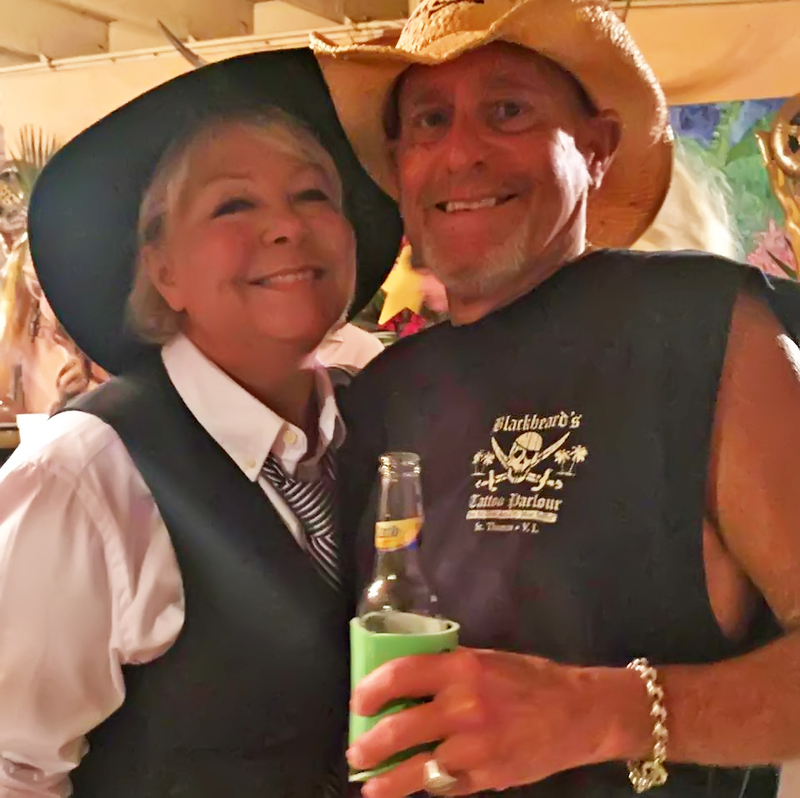 Robin Allen Greenlee, 59, formerly of Nevada, MO, passed away at his home in Kansas City on Tuesday, November 14, 2017 after a courageous battle with cancer. A small memorial will be held on Saturday, November 25th, at McGilley State Line Chapel from 1:00-3:00 p.m. In lieu of flowers, memorials may be made to Water Island Civic Association (waterislandwica.com). Robin is survived by his beloved wife of 21 years, Margie Greenlee. He was a proud father of his daughter Jennifer Greenlee and her wife Marlene, his son Zach Greenlee and his wife Cristin, his step-daughter Lauren Akers, his step-daughter Clare Carlson and her husband Rustin. Robin was the son of David and Peggy Greenlee, and brother of Lyndon Greenlee, wife Pam. He loved all of his grandchildren: Gabby, Ethan, Mareus, Harper, and Hazel. Robin was a talented athlete and excelled as a golfer in his adulthood. He loved hunting, fishing, grilling, and telling stories of memories made with his fondest friends. He cared deeply for all of his pets throughout life, his current pets being Gracie & Coco. 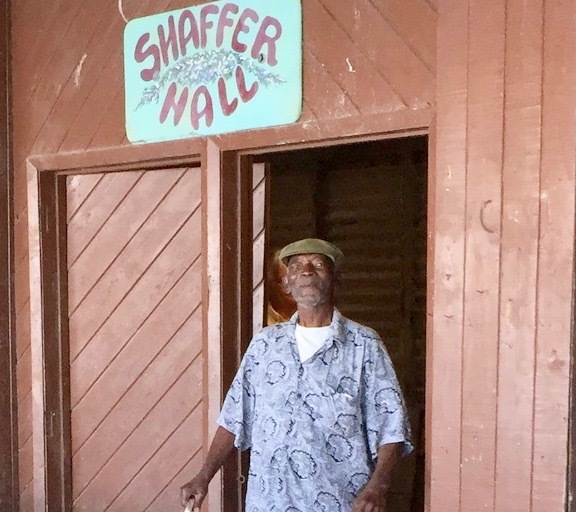 He was blessed to have found his Heaven on earth in Water Island, USVI. Posted August 25, 2017 We now have a 4th dumpster at the trash collection site. It has been clearly marked "For White Goods Only", such as refrigerators, washers, freezers, etc. This 4th dumpster is here temporarily so get your white goods down there soon. Posted July 26,2017 This Saturday, July 29th Millie Lovett has organized a great clean-up at the ferry dock. WICA would like to encourage all WICA members to volunteer in cleaning up this area. Thanks Millie! And Then There Were None!!! 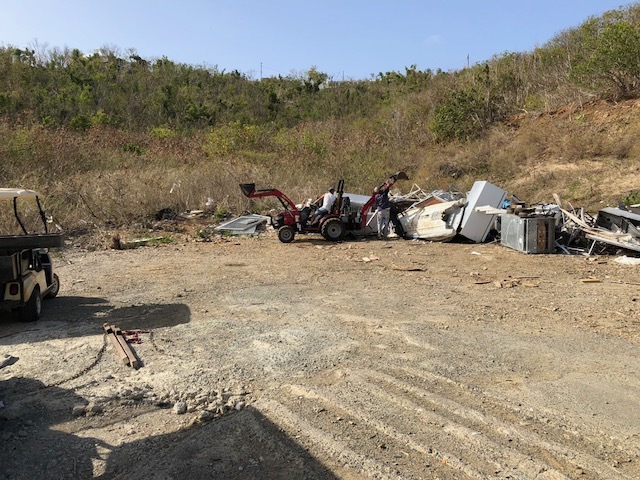 Posted July 19, 2017 And then there were none...Under the direction of WICA President, David Roselle and with the help of the Government Task Force, 22 more abandoned vehicles were removed from Water Island, for a total of 42 vehicles removed this year! Thanks also to all who contributed to the success of this project. Good job WICA! Posted July 11, 2017 Many long time residents & visitors to Water Island remember "Tuck & Sue". Sadly, Tuck (Tom) passed away recently. Below is his published obituary. Many Water Islanders remember that Tuck was associated with the Hotel in its day, and also was known for his kind care of animals. He often spent his own money to find homes for animal's on Culebra. He would take them to a vet in Puerto Rico and have them fixed and cared for before being adopted. He was a very kind man. 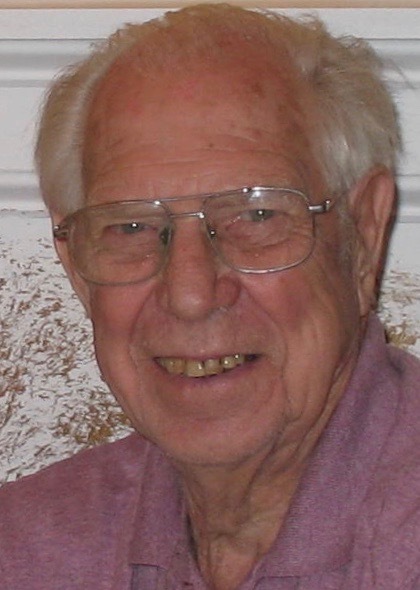 Thomas Owen Meacham Jr. born October 16, 1939 in Plainfield NJ, died June 25, 2017 at the age of 77 at Hospice House of Citrus County, Lecanto, Florida. He was surrounded by his wife, Susan Ventura and siblings Margaret Meacham Smith and her husband Karl, Eugene Meacham, Sheila Meacham Dunn and Michael Meacham. Dozens of nephews, nieces and cousins living across the United States and in Europe survive him as does TomÃƒÂ¢Ã¢â€šÂ¬Ã¢â€?Â¢s countless friends and partners. Family members who predeceased Tom are his parents Thomas Owen and Margaret Rossi Meacham and brother Sean (Nip). Tuck, Tucker or Tom, all names by which he was known, was a communicant of the Catholic Church. He grew up at Sycamore Farm in Shrewsbury, NJ. He attended school in Red Bank, NJ; graduated Delbarton High School in Morristown, N.J. and after receiving his BS at Villanova University, worked for the specialist firm Walters Peck on the New York Stock Exchange. 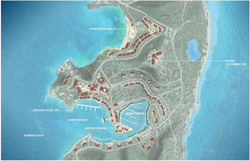 He left Wall Street to follow his heart and entrepreneurial drive to develop property in the Caribbean, Virgin Islands and Central America that included Ship Wreck Landing, Coral Bay, St. John, USVI; Honeymoon Beach Restaurant and Bar, Water Island, USVI; Posada La Hamaca Guest House, Culebra, Puerto Rico; and an extensive land development in Costa Rica. 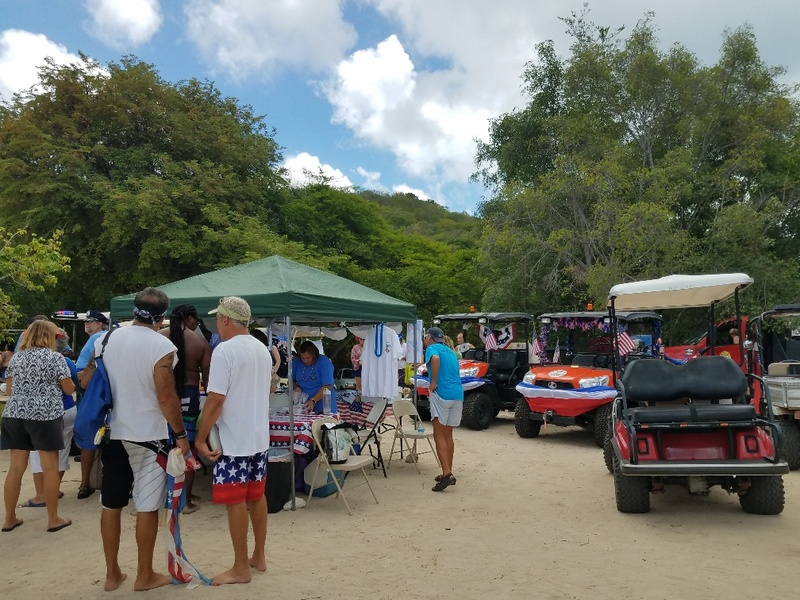 Tom held a special love for animals and was instrumental in the creation of an animal rescue service in Culebra which saw hundreds of rescued dogs and cats into good responsible homes. The greatest thrill and joy throughout TomÃƒÂ¢Ã¢â€šÂ¬Ã¢â€?Â¢s life were the numerous aeronautic activities in which he engaged: Hang gliding, paragliding, skydiving and parachuting. He attained expertise in the practice of his many passions that included fly-fishing, springboard diving, scuba diving, snorkeling, sailing and skiing. Tom traveled extensively throughout the United States that included a year long journey through Alaska and Canada. Easily shortlisted for ÃƒÂ¢Ã¢â€šÂ¬Ã‹Å“The WorldÃƒÂ¢Ã¢â€šÂ¬Ã¢â€?Â¢s Most Interesting ManÃƒÂ¢Ã¢â€šÂ¬Ã¢â€?Â¢, Tom was kind and absurdly generous, bound only by his rules, funny and stern, fierce, loyal, and brave; like a lion or a knight. Husband, brother, friend, benefactor, adventurer, storyteller, inventor, entrepreneur. Family and friends valued his life and mourn the loss. Service celebrating TomÃƒÂ¢Ã¢â€šÂ¬Ã¢â€?Â¢s life to be announced. Posted July 4,2017. Water Island and all of our residents and visitors would like to wish everyone a very happy and safe 4th of July! will become due on 30 Jun and will become delinquent if not paid by 30 Aug 17. Property tax bills can be paid online at http://propertytax.vi.gov/. Tax office telephone is 340 776 8505. Last year many Water Islanders did not get a hard copy of the bill in the mail. Regardless, they were penalized if not paid in the allowable time. Posted June 2, 2017 The next time you see David Roselle, the President of WICA, please make sure you thank him and give him a BIG pat on the back! You probably don't recognize the Water Island road in this picture because it has NEVER, NEVER looked like this. It is the Dump Road. David has done a fantastic job coordinating with the Department of Public Works to get reclaimed asphalt spread on the dump road. Great job David! Thank you for helping improve the quality of life for Water Islanders. Your efforts are greatly appreciated. 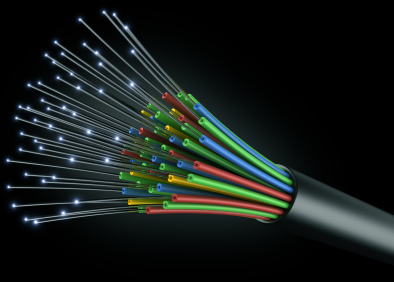 Posted May 20, 2017 Fiber Optic Cable may be coming TO YOUR HOUSE! We received word from Alex Randall that a crew from an internet provider, Orbitel, was on Water Island recently. They are interested in providing internet by Fiber Optic Cable to the residents of Water Island. They will be contacting residents to see if anyone is interested in receiving extremely fast internet service at a competitive rate. They indicated to Alex they would need about 25 - 30 homes to sign up to make the committment to service the island. So, stay tuned and keep an eye out for any correspondence from Orbitel. 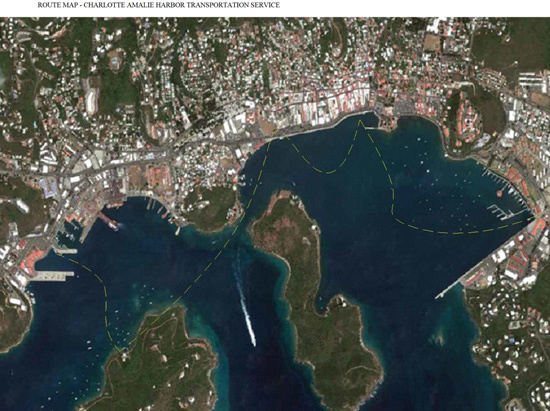 Posted May 14, 2017 The Government of the U.S. Virgin Islands has advertised a "Request For Proposal" to provide WATER TRANSPORTATION SERVICES FROM THE AUSTIN BABE MONSANTO MARINE TERMINAL SERVICING WATER ISLAND, CHARLOTTE AMALIE HARBOR AND HAVENSIGHT/YACHT HAVEN GRAND IN ST. THOMAS, U.S. VIRGIN ISLANDS. This subject was discussed at the WICA EC meeting held on May 13, 2017. 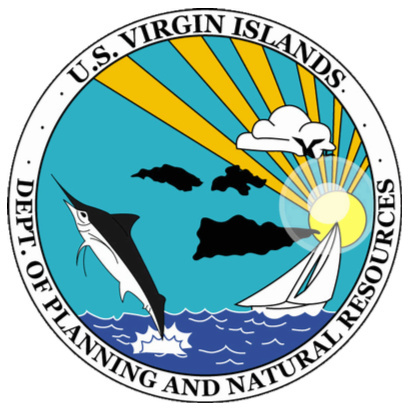 It was decided that a committee be formed to draft a letter to the U.S. Virgin Islands Government, from the Water Island Civic Association, outlining the potential effect this RFP would have on Water island AND the U.S. Virgin Islands Government. You can read the RFP HERE. Posted May 11, 2017 The next Water Island Civic Association Meeting is Saturday, May 13, 2017, 9AM at the Firehouse. The WICA meetings are open to all so come out and get involved. Posted May 3, 2017 If you have been to the ferry dock over the last month or so you probably noticed the ragged, torn Virgin Islands flag on the mast. Well, NO MORE! 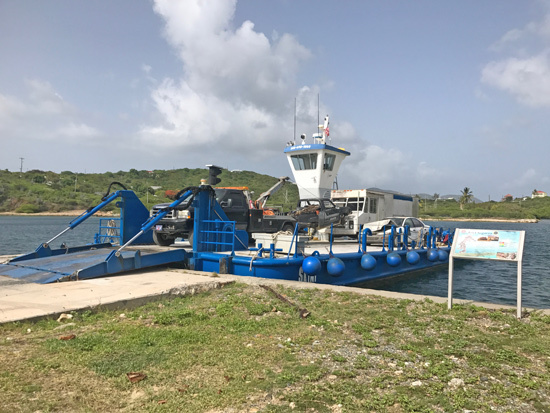 Thanks to Jane Wherren and Crown Bay Marina for the donation of a brand new Virgin Islands flag for the Water Island ferry dock! 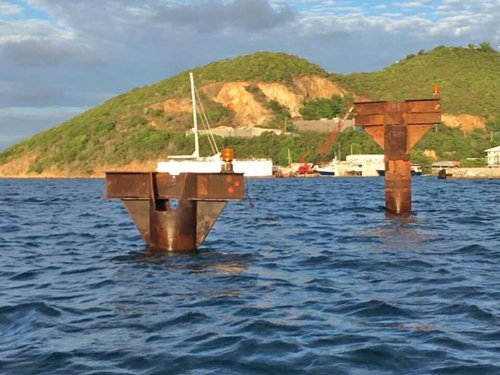 Posted April 25, 2017 Any Water Island boater going between Water Island and St. Thomas, please use EXTRA caution when approaching St. Thomas! 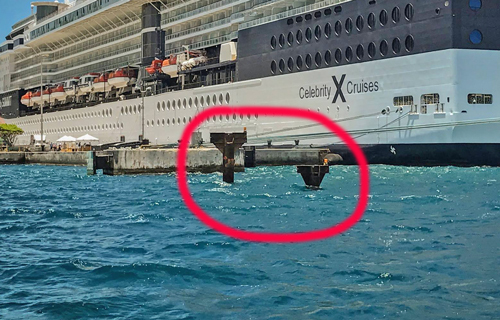 A dolphin extension is being placed at the cruise ship pier area and IT IS VERY DIFFICULT TO SEE AND A TREMENDOUS HAZARD! We've already had several Water Islander deaths in this area, please use caution. Season Is Coming To An End! Posted April 22, 2017 Another season is almost behind us now on Water Island. A lot of our friends are beginning to leave for the Spring/Summer up north. We wish them all well and look forward to seeing them later this year. Posted April 19, 2017 If you have been to Honeymoon Beach the last couple of days and noticed how good all of the Palm Trees look, take a moment and thank Rachael Ackley! Rachael was kind enough to take on the task of coordinating and supervise the trimming of all the Palm trees AND having fresh Palm fronds put on the palapas. Posted March 15, 2017 At the Jan 17 Annual Meeting, WICA agreed to donate $1000 to Lucky Paws Foundation. The Foundation pays local vets to ÃƒÆ’Ã‚Â¢ÃƒÂ¢Ã¢â‚¬Å¡Ã‚Â¬Ãƒâ€¦Ã¢â‚¬Å“fixÃƒÆ’Ã‚Â¢ÃƒÂ¢Ã¢â‚¬Å¡Ã‚Â¬Ãƒâ€šÃ‚Â? the cats and there is no cost to the person who brings in the cat. The Foundations objective is to reduce the proliferation of wild cats. In the last 2 months, the Gidleys and Learmonts have captured 19 cats and taken them to St Thomas to be fixed under the Lucky Paws Foundations arrangement. 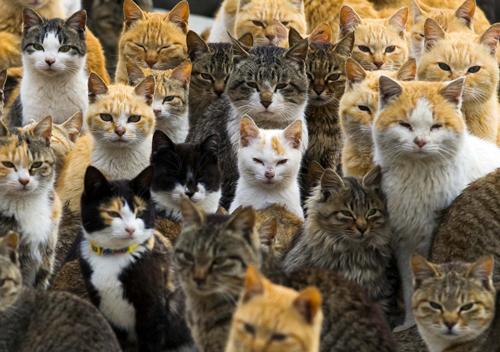 Of the 19 cats, 10 were female. So what is the impact on Water Island of just getting 10 females fixed. The local vets say that a female is likely to have at least two litters per year. Each litter will average 5 kittens. So do the math. By having 10 females fixed, we have reduced the potential population growth by 200 kittens. If you are interested in helping catch the cats and taking them to the vet on St Thomas, contact Linda Gidley 9340 690 2814) who will provide live traps and instructions on the how to get the cats fixed. A Big THANK YOU! to the Gidleys and Learmonts! 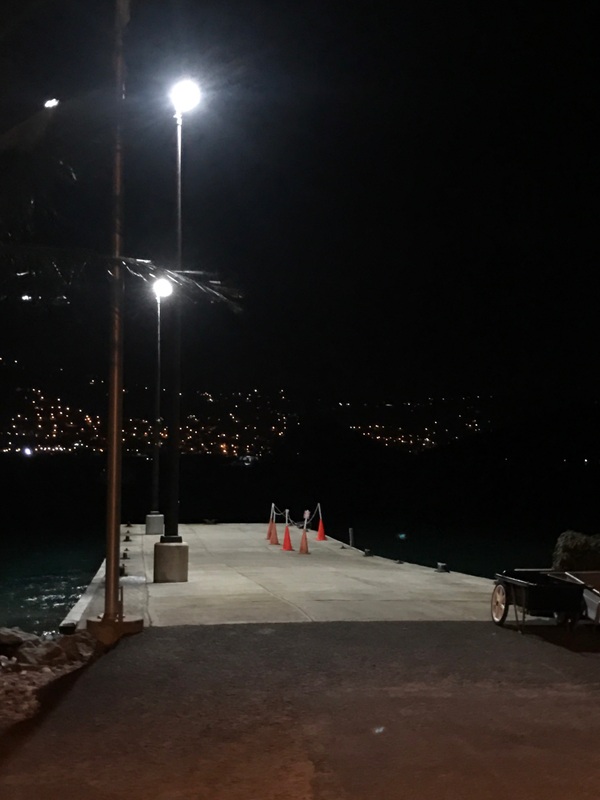 Posted March 10, 2017 Thanks to the efforts of WICA President, David Roselle, we now have lights at the ferry dock! As of this minute they are on all the time but as soon as WAPA fixes a problem with the photo cells they will be off during the daylight hours. These lights help make the dock area and the dock a MUCH safer area for pedestrians and boaters. Posted February 10, 2017 The next Water Island Civic Association Meeting is Saturday, February 18, 2017, 9AM at the Firehouse. The WICA meetings are open to all so come out and get involved. Posted February 8, 2017 On February 3, 2017, our longtime friend Roland passed away. 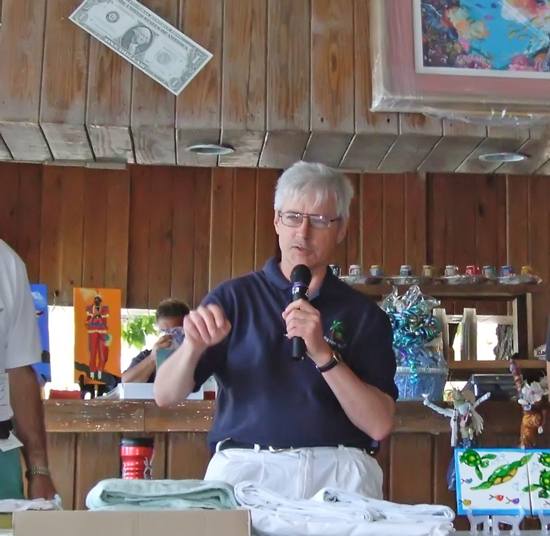 Just a month ago we celebrated Roland's retirement after working on Water Island for 54 years. We will miss you our friend! Relatives and friends are respectively invited to attend the viewing on Thursday, Feb. 16, 2017, at Church of God of Prophecy, Estate Hoffman, from 9 to 10 a.m. Service follows at 10 a.m. Interment is at Smith Bay Eastern Cemetery. Posted February 3, 2017 We all know that there are many wild cats in the bush on Water Island. Lucky Paws Foundation has arrangements with two vet clinics on St Thomas who will ÃƒÆ’Ã‚Â¢ÃƒÂ¢Ã¢â‚¬Å¡Ã‚Â¬Ãƒâ€¦Ã¢â‚¬Å“fixÃƒÆ’Ã‚Â¢ÃƒÂ¢Ã¢â‚¬Å¡Ã‚Â¬Ãƒâ€šÃ‚Â? the cats at NO COST. The Water Island Civic Association made a donation to Lucky Paws this month. All you have to do is catch the cats and take them to the vets. ÃƒÆ’Ã‚Â¢ÃƒÂ¢Ã¢â‚¬Å¡Ã‚Â¬Ãƒâ€¦Ã¢â‚¬Å“FixingÃƒÆ’Ã‚Â¢ÃƒÂ¢Ã¢â‚¬Å¡Ã‚Â¬Ãƒâ€šÃ‚Â? is done on Tuesdays thru Friday at two vet clinics. If we do not start to take care of the problem, it will get worse. So please consider helping out. Lee Humphrey Shaffer, 62, passed away peacefully on January 23, 2017 at Hamilton Pointe in Newburgh. He was born on August 27, 1954 to Anne Ford Shaffer and Gerald Shaffer in Evansville. Lee attended Washington Elementary School, Bosse High School and Indiana University, where he graduated in 1976 with a degree in Business. While at IU, Lee lived at the Phi Delta Theta house where he developed long-lasting friendships with his "Brothers in the Bond." He was an avid St. Louis Cardinals and Indiana Hoosiers fan. After graduation, he continued in the family auction business, hosting many auctions of real estate and personal property. Recently, Lee had resided at a Willow Park Retirement Community and developed many friendships there. He was preceded in passing by his parents, and is survived by brother, Tom Shaffer (Joyce) of Walterboro, SC and sister, Jane Lee (Rex) of Loveland, OH. He is also survived by niece, Lauren Shaffer McKinney and nephews, Andrew Shaffer and Benjamin Lee. Visitation will be held at East Side Christian Church, 2001 Bayard Park Drive, on Saturday, January 28 at 9:30 am. A celebration of life service will follow at 11:30. In lieu of flowers, please make memorial contributions to East Side Christian Church. Posted January 7, 2016 A big "THANK YOU" goes out to Mary Dunakey for a fabulous Christmas Light show this year! Mary spends countless hours working on the Christmas Light Show so that all Water Islanders and visitors are captivated by the Christmas spirit. 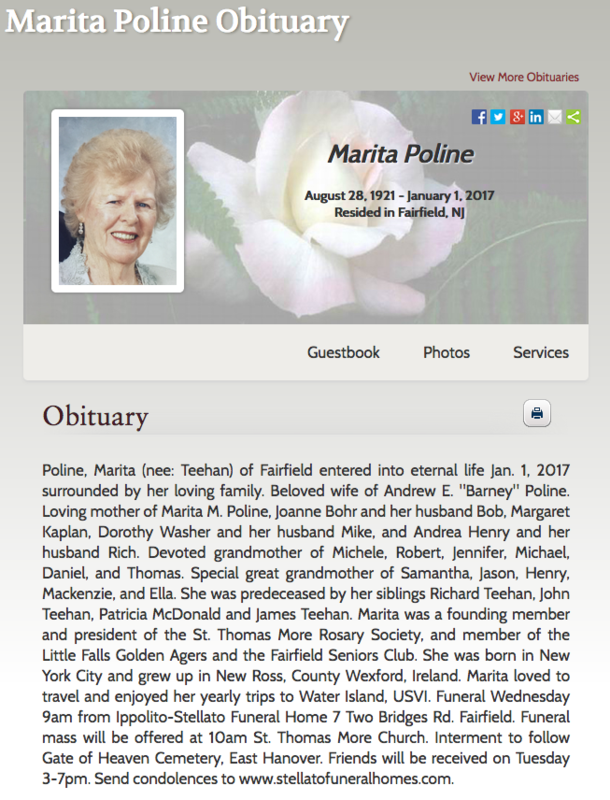 Posted January 2, 2017 Joanne Bohr's wonderful mother, Marita Poline, passed away yesterday surrounded by her loving family. 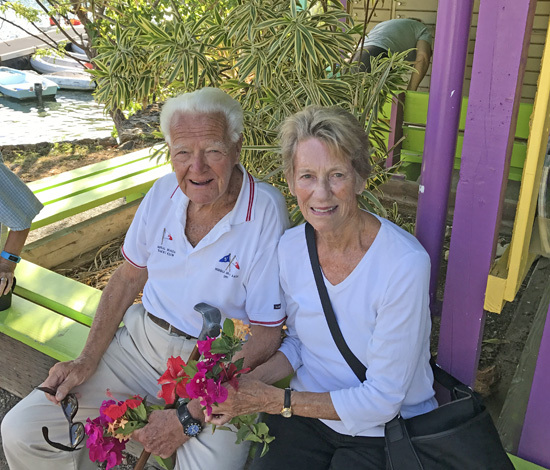 Marita and her husband of 68 years, Barney, were regular visitors to Water Island and became friends with all of us. We will miss you but never forget you Marita!